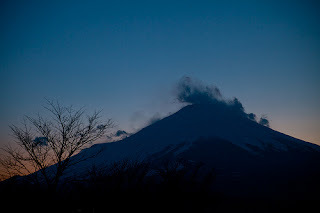 Fuji's smoke curls upwards into the pale-blue heavens. The snow bathed in the morning sun glows alpine-rose. Happy New Year Happy New Year. How grassy is Wakamatsu's green. Bursting fit to bust with hooch. Men and women alike hair everywhere. If they venture outside their huts at dusk. 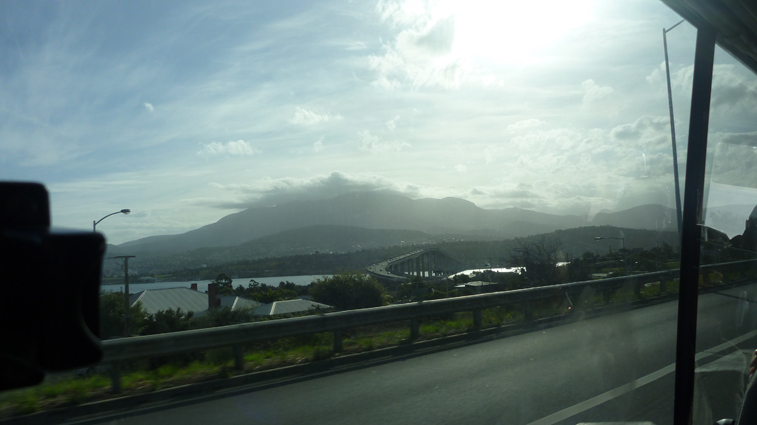 Ascending straight to the heavens. Kusano Shinpei, New Year 1971. From Mt Fuji Selected Poems 1943-1986 by Kusano Shinpei that just arrived today in the post along with some thesis reading. I was working on a post about eggplants but I'll leave that till a latter date. Project Hyakumeizan recently posted another poem from the series. 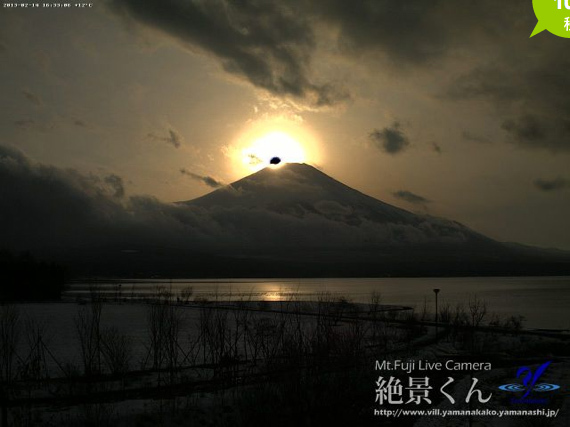 Photos from the flickr group Mt Fuji by ever_green60 and yehkai, respectively. 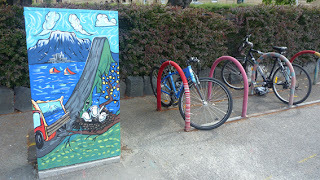 With this post a further 7 months late... all I can hope for is that my PhD thesis does not befall the same fate. 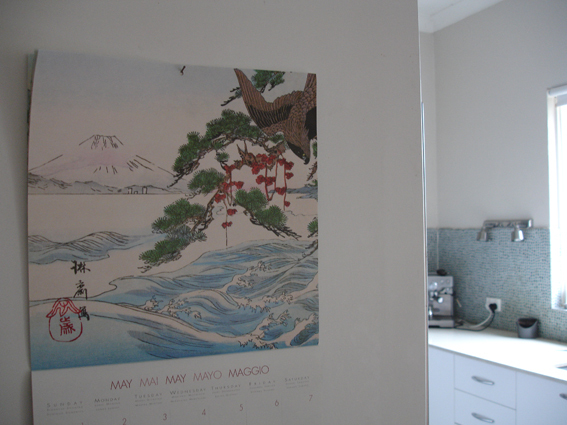 Hacio gave me a calendar for Christmas this year of details from woodcuts by Rinsai Utsushi (active, c. 1869 - 1890). The image for the month of May stood out, not only is Mt Fuji snow capped in the distance, there is also an Otaka (goshawk) as the detailed feature in the fore-ground, and the artist name stamp in shape of an eggplant. The calendar was put out by a Dutch company, and by the looks of things by designers who are not woodcut enthusiasts, otherwise I think the three lucky dream images associated with New Years Eve would appear as the picture for January. Below is the print in full. I did a fairly extensive search for some more information on Utsushi. 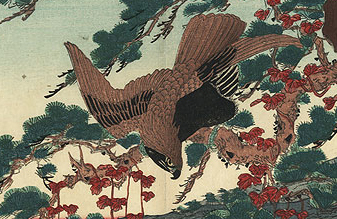 But not much is online- only a brief entry on a commercial woodcut dealers site that lists his main subjects as Kacho-ga or Kacho-e -flowers and birds. This subject matter started to become popular in the Meiji period and was further developed by the Shin hang print movement. 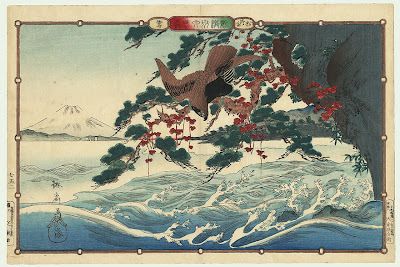 However in the West, by the turn of last century "birds and flowers" was considered to be the genre of women "hobbyists" and I wonder whether this dismissive attitude has contributed to the absence of Utsushi's work from the collections of the Smithsonian, British Museum, V& A, and all Australian state art galleries. 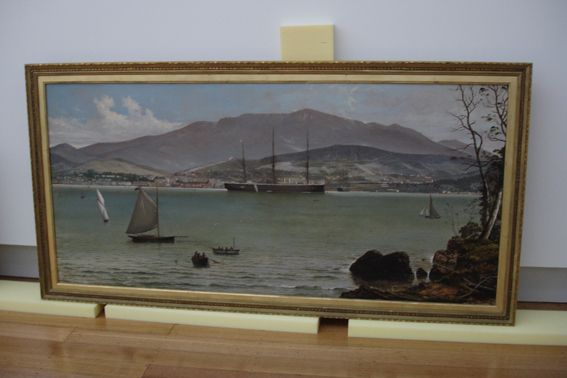 There are two prints in the Canadian Museum - the Art Gallery of Greater Victoria. 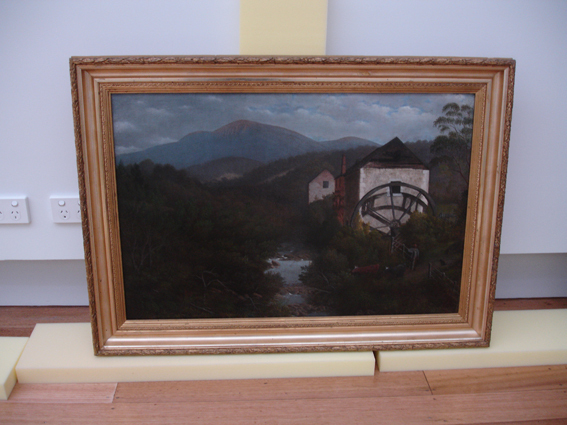 The AGGV has the largest holdings of Japanese art in Canada and like many regional museums the collection is often made up from gifts from local citizens, in this case Mr. & Mrs. William Hepler. Unfortunately the online search facility only allows for searches via artist and artwork title, so I was unable to see what else Mr. & Mrs. William Hepler donated and perhaps make an assessment of Utsushi standing within their collection or even to find out some more information about who where the Heplers. 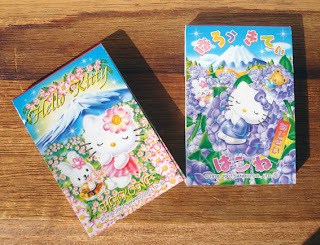 Hello Kitty post-it notes. I'm not sure how to use these, anything I write on them is a bit invisible. This is the opening paragraph in Shizuko Natsuki's Murder at Mt Fuji. 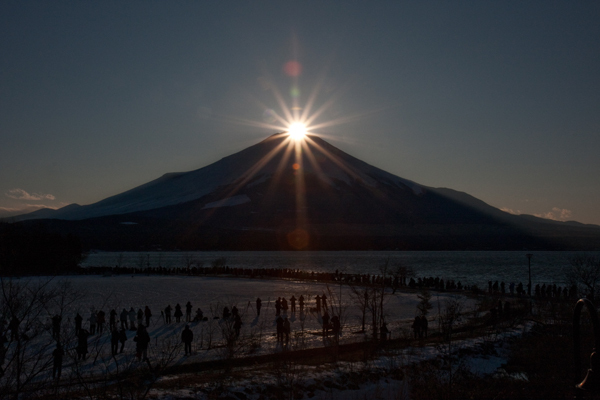 Set in the fictional posh suburb of Asahi Hills on the edge of Lake Yamanaka in the Fuji Five Lakes district. 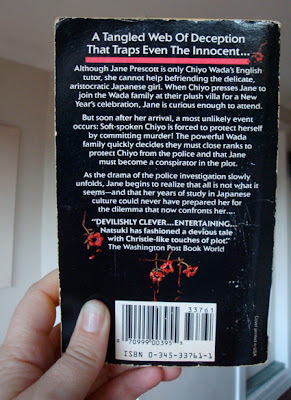 The story is mostly told from the perspective of Jane Prescott, an American student studying at the Tokyo Women's University. 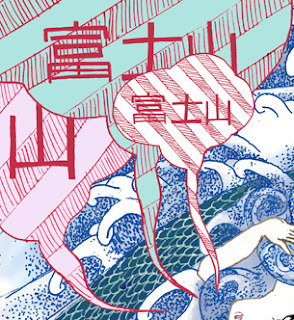 As the private English tutor and friend of Chiyo Wada, the daughter of a wealthy Japanese family, she finds herself somewhat awkwardly invited to the Wada family New Year celebration at their weekend home, on the shores of Lake Yamanaka. The first pages describing Jane's journey to the family home with some wonderful descriptive passages that really evoked for me the experience of travelling by train and bus in and around Tokyo. There were about ten people waiting at the bus stop by the time the bus was ready to leave. 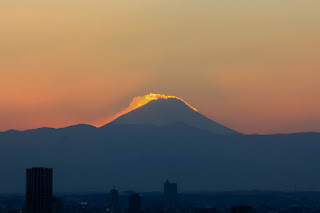 It left promptly at 2:30 and threaded its way through the shop-lined streets of the city and out onto highway 138, Mt Fuji soaring majestically in front of them. 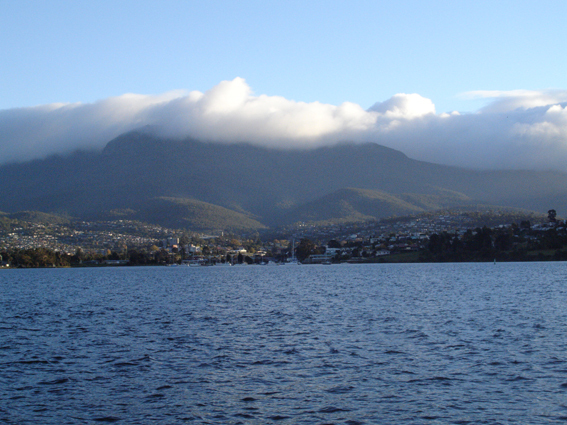 Although capped with snow the mountain was not completely white; dark blue streaks running down from the peak accentuated the steepness of its slope. Natsuki uses the location of the remote country home, and adds a heavy snow storm to the night of the murder, to create a variation of the "locked room mystery". 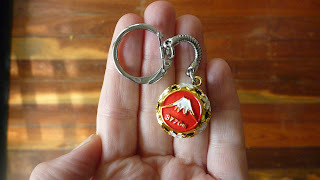 There are two other points in the novel where a description of Mt Fuji appears. Both occur where the characters (detective Nakazato and Jane, respectively) are having moment of internal reflection on the events which are swirling around them. In these paragraphs Natsuki evokes the subtle changes in mood as a way to describe time passing, yet emphasis the continuity of the power the mountain exerts over the surrounding landscape. 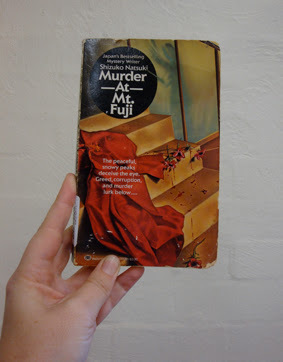 This was Natsuki's first novel translated and published in the English. Six of her novels appear on several sites as available in English, although a simple search on her name on Amazon shows that she is a prolific writer like P. D. James. 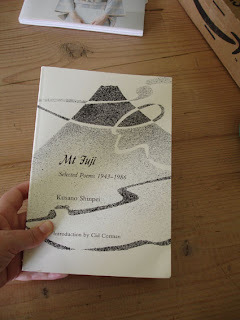 Having never read any other of her works, I am wondering whether the setting of Mt Fuji, and the American protagonist Jane Prescott, where unique to this novel and way to give something familiar to an English speaking audience. Some of the characters, namely Jane, are not mentioned at all, and the the movie synopsis on imdb describes the re-setting of the novel in a theatre. With a bit more digging around I relies that Natsuki's story has become a stage play, acting as the inner story which reveals the truth of the main narrative, moving the literary convention from a "locked room" to a "play within a play". 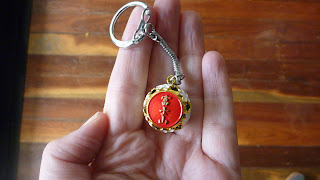 Cat bell tinkling charm. Fuji profile and height on one side and name on the other. A recent gift from Haico. Thanks to a recent post on 100 Hundred Mountains I discovered Okinawa Soba aka Rob Oechsle, a collector of Meiji and Taisho Japanese photography. Along with an amazing flickr collection, he also has a labyrinthine website devoted to T. Enami a turn of the century photographer based in Yokohama. 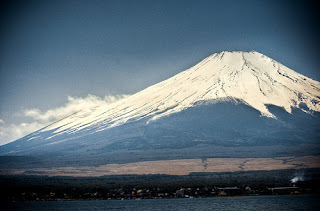 There are about 3,000 images on his flickr profile, many with including Fuji as the central subject or used as a back drop. I spent several hours this afternoon trawling through his collections loosing myself in beauty and wonder. Although this is not an image by T. Enami, I have decided to post the following salt print with Okinawa Soba commentary in full. It gives a feel for his writing style and for the seriousness of his collecting and generosity with sharing his research. It's a fascinating project by an unusual man. No Photoshop or Paint Eraser here. Posting un-retouched AS IS !!! 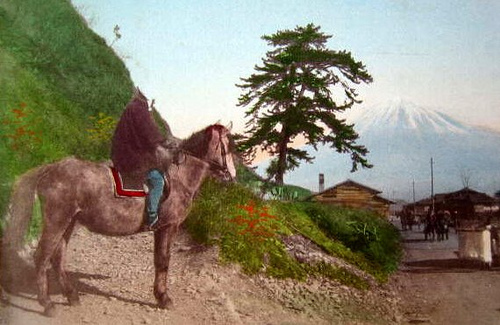 This ca.1890s photograph was printed as a postcard size image around 1905 by a commercial photographer using the "Salted Paper Print" process. No standard albumen, collodian, or gelatin emulsion coatings for this guy. He was going to do it the "Classic" way like the old "Salt Print" and "Calotype" days of yore....and color it when he was done. I will be the first to admit that the commercial revival of the classic salt print is pretty cool...and pretty rare for the late Meiji era. But, depending on how they were processed, these rare and often beautiful "revival salt prints" sometimes had a strange side effect: Very light areas, such as the face, or light clothing, had a tendency to lose the details -- and sometimes disappear altogether. On some of these pictures (not all), the dreaded "fade-out" syndrome would hit those extremely light portions within a relatively short time, but leave the darker areas untouched. Even the once delineated summit-line of Mt. Fuji has reached a touch-and-go point in this image. And our poor fellow on the horse, whose head was wrapped in a white winter "turban towel", just happened to line himself (and his neck) directly with the slope of the hill behind him. It was only a matter of time before he.....well, before he LOST HIS HEAD !. 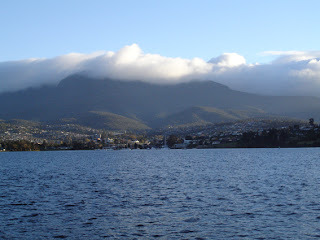 I've been travelling to Hobart pretty regularly since November 2003, mostly to make art. 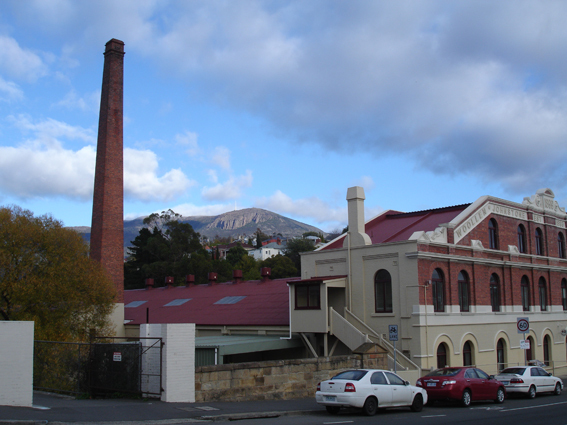 Last week I finally got to show my work in Tasmania at CAST gallery. 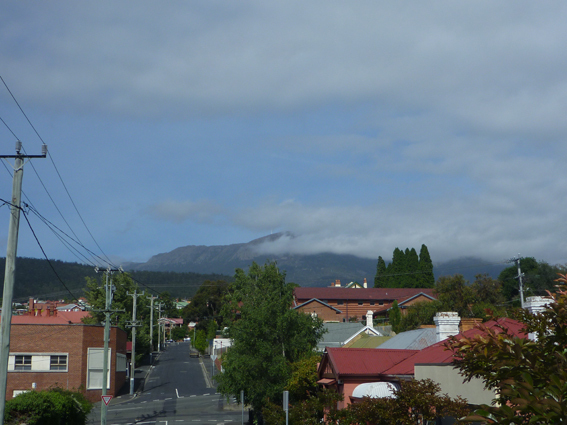 When I was down there last week I had a very odd realisation- Mt Wellington was my first "Mt Fuji". It's shape is completely different but the way it's celebrated in art history and how you watch it is similar. From the moment it greets you as you come over the ridge from the airport it shapes your experience of the city and the weather. I'm not the only one who has had this association. 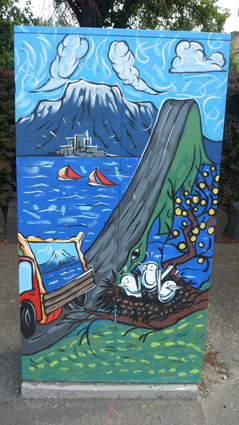 Below is a electrical street box near Parliament House. Perhaps my attraction to Mt Wellington had primed me for my Fuji obsession and certainly if I lived in Hobart I would want to at least have one window that had a view towards the mountain (although not in the valley of South Hobart where you are in the shadow of the peak and some houses do not get any direct sunlight for six months). Also, I keep saying one day I will climb from the base to the summit- instead of the usual walk across heathland. 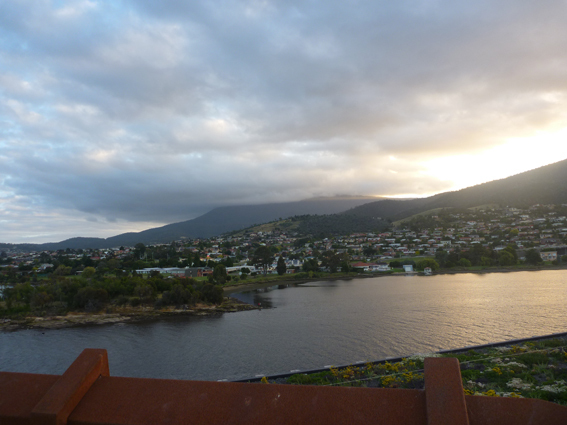 My story with Tasmania is starting a new chapter as I will mostly be travelling to Launceston for the next 6 months and after that I hope to have a break from the south and spend some time in the dry centre, or wet north. Fuji on the side of Illustrated Man- one of Sydney's oldest and most famous tattoo parlors- disappearing behind a security screen door. I would be curious to see who has a Fuji tattoo. As most tattoos are made to memorialise a person or event, I'm interested in what exactly they were associating with the mountain? 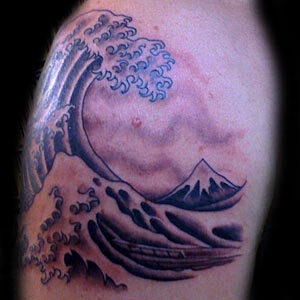 There is one photo of a Fuji tattoo on the Illustrated Man website gallery. The shape of the mountain is totally wrong, and the file was called "Wave", which I find interesting as I suspect that being a beach culture, most people in Australia focus on the energy of the wave not the stillness of the mountain. Oddly the boat is in the tattoo but not the occupants. That curve and flat roofed peak is so perfect and calming to gaze upon, in fact its shape is everything- which makes me think that its inclusion in tattoo above is an after thought rather than its motivation. On one of the entries on the British Museum database there is a quote by an artist describing how getting the perfection of Fuji's shape as a lifetimes work- I found it one night while procrastinating and now have no hope of remembering which of the 619 entries it was.